RUFF LOVE: With its innovative and catchy remix of Kylie Minogue’s “Love at first sight” (Capitol) riding high on the Billboard dance charts, Belgian production unit Ruff & Jam has made a big step onto the international scene. “Stephen Bass, who is our UK Rep, was given Kylie’s a cappella version of “Love’s at first sight” by Parlophone” Mourinet Explains. Ruff & Jam’s next project is the soundtrack to the Mental Pigs cartoons, which will air as a TV Series in 2003. 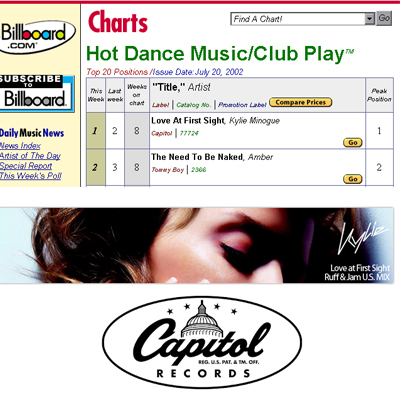 The remix of “Love at first sight” has become a highly sought after track in Belgium, where it is not commercially available.